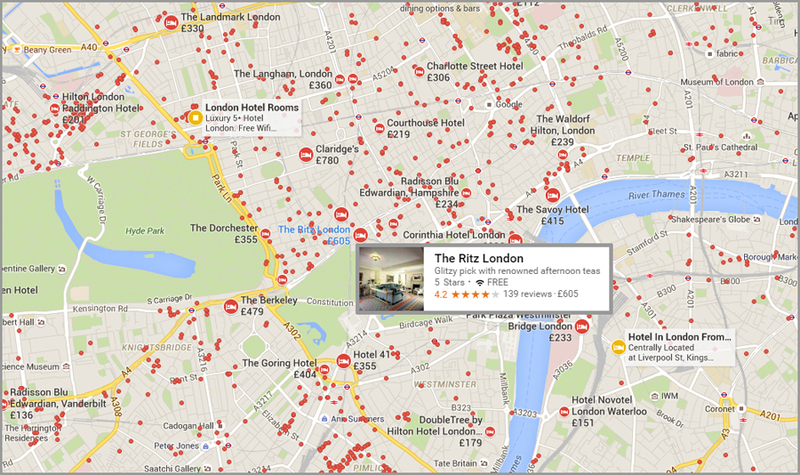 The key element in any Hotel SEO is reinforcing your location across your online property. A hotels physical location is one of the primary factors that underpins a customers search when looking for a Hotel, Bed & Breakfast or Guesthouse. Location based characteristics refer to features that describe the geographic environment information of a hotel accommodation. Service based characteristics are used for specifying the performance of a hotel accommodation, including hotel amenities, appearance and service. The above list is a condensed version of research conducted into hotel characteristics that influences a customers decision. It does however highlight the importance of reinforcing a hotels location and also provides future areas where hotels can expand their informational content on site. The first steps in reinforcing a hotel, bed & breakfast, guesthouses location within their site is to add the hotels: Name and full Address in the footer of the website. The footer allows the address to become visible site wide and also allows us to add structured data into the page. I also add contact details, however the hotels Name and Address are the most important bits of information. In the case of a hotel brand that has multiple hotel locations, all property pages ( Pages belonging to a specific hotel ) should have their own footer which displays their own hotels specific location and markup. Brand pages, not specific to a hotel property, should use organization markup. Make sure that social profiles on page should be matching to that specific hotel and “same as” structured markup applied where applicable. If possible I would try and have the hotels location within the H1 tag, however you need to balance the aesthetics and if it does not look quite right, then H2 will do. Remember H1, H2, H3 sizes can be changed across site in the CSS or you could individually style the size, you are not stuck with one size, speak to your developer. These SEO basics should be worked into all pages across the relevant hotels property pages. Hotel guests shop and book on either supplier or OTA sites, rarely both. Hotel searchers tend to conduct between five and six search sessions before they book. in which to promote various ancillary product offers. Low brand loyalty in the travel market means nearly every hotel guest is a “free agent.” Don’t take loyalty members’ business for granted: The majority of regular hotel guests stay at multiple chains throughout the year. Loyalty can’t be demanded, it must be earned. steps to understand their guests to the fullest extent possible.